Gazprom and CNPC are working on finalizing a deal to provide gas from Russia to China via the Altai pipeline. 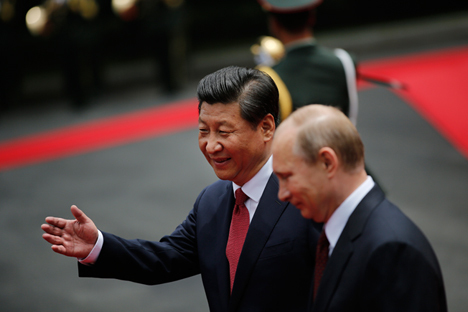 The agreement could be signed during Chinese President Xi Jinping’s visit to Moscow for Victory Day. According to sources close to Gazprom, the Russian gas giant intends to sign a contract with China’s National Petroleum Company for supplying gas through the Altai gas pipeline during Chinese President Xi Jinping's visit to Moscow for the celebration of Victory Day. The deal, which was first proposed last November, is Russia’s second major commitment to China, after the agreement to provide gas via the Power of Siberia pipeline, signed in May 2014. "[Gazprom Vice President Alexander] Medvedev said that he will try to sign the contract (during the May 9 visit)," a source close to Gazprom told Vedomosti. However, the source doubts that the sides will reach agreement on all the details of the contract by this time. According to the source, a more likely scenario is that the contract will be agreed upon in principle during Jinping’s visit and signed when Jinping returns to Russia to attend the BRICS summit in Ufa, which will take place July 8-10. The framework agreement for supplying gas to China via the Altai pipeline was signed in Beijing in November during the APEC Summit, in the presence of Jinping and Russian President Vladimir Putin. According to the framework agreement, China intends to import 30 billion cubic meters of gas annually from deposits in Western Siberia. In November, Gazprom President Alexei Miller said that the final contract could be signed in mid-2015. Miller was in China in February to discuss the Altai pipeline deal. He said after the visit: "The construction of the gas pipeline is very close to beginning. In terms of commercial negotiations, we are moving with good speed." In September, Putin said that the Altai pipeline can be constructed faster than the Power of Siberia, so if the deal is signed soon, the Altai pipeline project may take priority. Putin’s spokesman Dmitry Peskov told Interfax on March 18 that while the Kremlin does not rule out that a contract on gas deliveries via the Altai pipeline could be signed in May, the Russian side is not set on the May 9 deadline. “As a rule, the signing of contracts is not adapted to specific dates. Therefore if the contract terms are agreed upon, we cannot rule out its signing. If they are not, then talks will continue,” Peskov said. Gazprom, however, has more interests in supplying China via Altai because of the cost of operating existing production capacities in Yamal. These deposits are currently linked to the European market, but Europe is reducing its gas imports from Russia. The Power of Siberia will be supplied via new deposits in eastern Siberia that are not yet online.